Citizens! – Photo courtesy of Citizens! 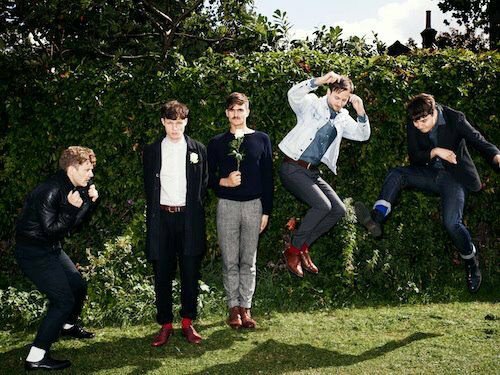 If you ask the members of Citizens!, a London-based indie-pop band, currently at the peak of its hype, they would likely tell you that they did things a little bit backward. “We kind of started the band just over a year ago, and I guess we did everything the wrong way around,” singer Tom Burke admitted. More specifically, what he means is that instead of the typical album release followed by extensive touring, the group built up a name for itself with a couple of singles and little else, creating a demand in a sort of roundabout way. The band’s debut single, “True Romance,” came out in December of last year, followed up by “Reptile” early this year. Meanwhile, the third single, “Caroline,” is due out in July, although the accompanying music video has already been circulating the Internet far and wide. But first, the band (which also consists of members Mike, Lawrence, Martyn and Thom) will be releasing its debut full-length, “Here We Are,” on May 28. Recorded in Scotland in the latter half of 2011, the album was also produced by Alex Kapranos, who is best known as the singer of Scottish band Franz Ferdinand. Now, the five are on a tour of Europe for the months of May and June, in an effort to promote the release, which will be put out on label Kitsuné. Interestingly enough, all five members of the band are in their 20s, and have grown up with the idea of albums as a collective entity. So with doing things differently, there is a question of whether or not there is some kind of pressure involved in releasing singles, with the expectations of both the band itself and the fan base to consider. Yet Burke says the band doesn’t really think of things in those terms, instead focusing on writing songs that appeal to the members themselves, and hoping that the rest – meaning the interest of listeners – will naturally follow suit. It’s no secret that the guys in Citizens! are keen on pop music, citing Michael Jackson and Kanye West high among their influences. And its exactly this kind of shameless attitude that makes the band so appealing, particularly to people who are sick of pretentious musicianship. As for the songwriting itself, the group tends to steer clear of jamming, which Burke commented lends itself to uninteresting results. “I think, like, you could write really boring music if you just jam all the time,” he explained. And although the new album is yet to be released, naturally, the five are already talking about what will come next, something which Burke pointed out as sort of going against the singles-grain. “That’s a place where albums are still influential,” he said, citing how successive albums can expand upon an established sound or introduce an entirely new one, in a way that singles don’t necessarily demonstrate. But of course, there is a struggle to make certain that whatever the next step is, that it makes sense in the greater context of the whole band. In terms of the next step, there is no consensus yet, even though the band is constantly writing new songs, in part because it sometimes takes awhile for all five to get on the same page. Citizens! plays tonight at Frannz in Berlin. The show begins at 20.00. This entry was posted in Interview and tagged British, Citizens!, Feature, Interview. Bookmark the permalink.